I have been craving a certain dish from PF Chang’s…their garlic noodles. They are spicy and fragrant with refreshing cucumber matchsticks and fresh cilantro. Today I replicated it pretty closely using my new obsession: zoodles. 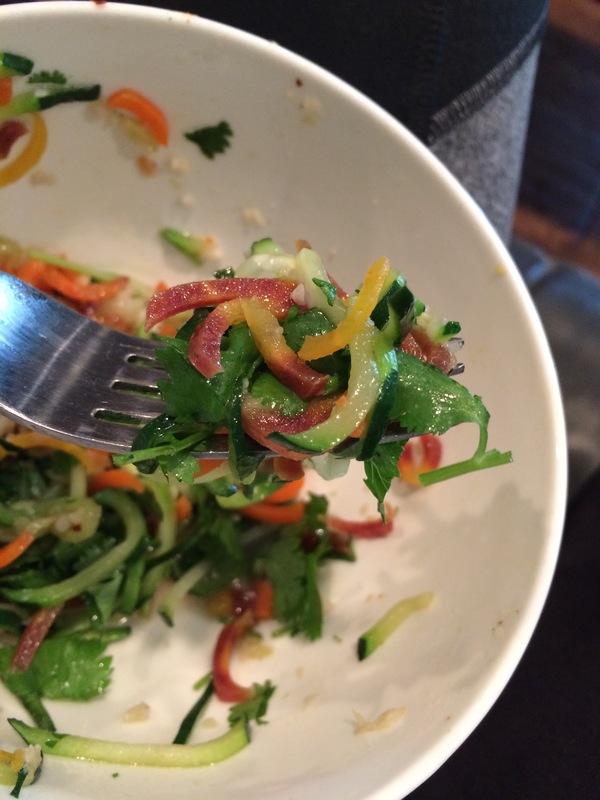 Zoodles are zucchini noodles made using a spiralizer. I love pasta, and I love vegetables, so I knew I would love veggie “noodles” when I first heard of them. I also would love to lose some weight and I’m hoping that by really enjoying my carb-free, low calorie meals I can drop more of this post-baby weight. 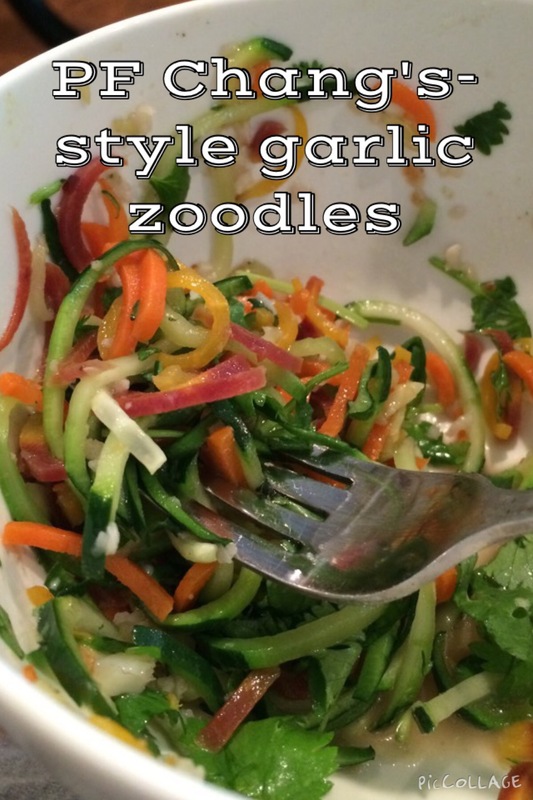 Today’s zoodles were zucchini and rainbow carrot noodles. The carrots are harder to spiralize, but worth it for the flavor and color they lend to this dish! 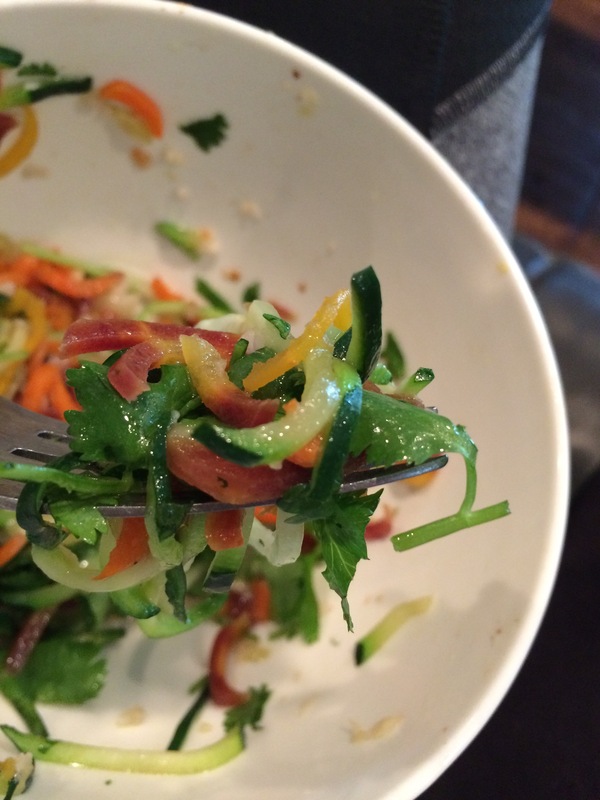 Spiralize Italian squash, carrots, and half of cucumber using a spiralizer. Heat 1 tsp. avocado oil in a pan or skillet. Add crushed red pepper flakes and garlic. Sauté about 2-3 minutes or until fragrant. Add zoodles and season with salt and pepper. Sauté for another 5-7 minutes, stirring often, or until they reach desired softness. Plate your dish of zoodles. 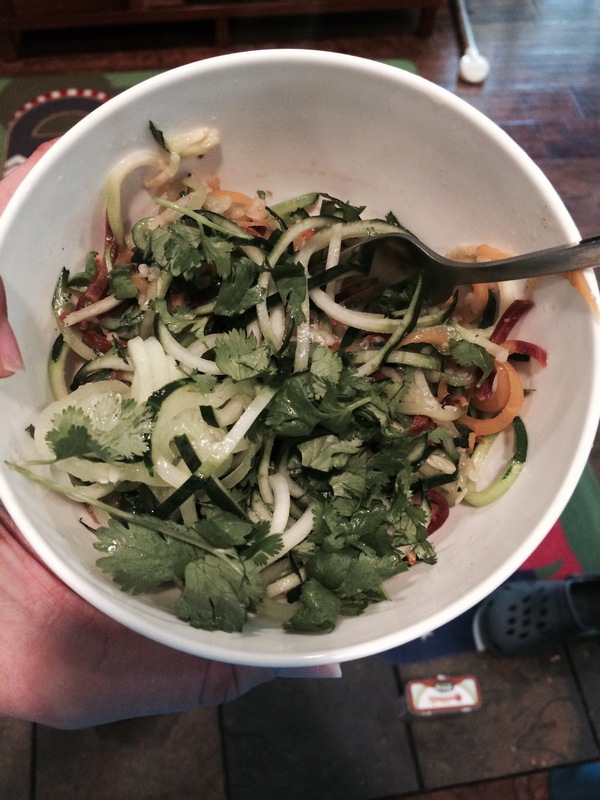 Top with spiralizer cucumber and cilantro. You can add more red pepper if you’d like to increase the heat. Serve immediately. This entry was posted in cooking, recipe and tagged alternative, asian, carrot, cilantro, copycat, cucumber, cuisin, cut, delicipus, eating, garlic, healthy, light, lovers, low calorie, noodle, pasta, pf changs, rainbow, red pepper, spiral, spiralized, spiralizer, squash, swap, vegetables, vegetarian, veggie, zoodles, zucchini. Bookmark the permalink.